Exhibition catalogue & artist-book for Franz Graf’s „Siehe was dich sieht / See what sees you“ exhibition at 21er Haus, vienna, January - May 2014. As with all books by Franz Graf this is a beautyful and thought-through edition. 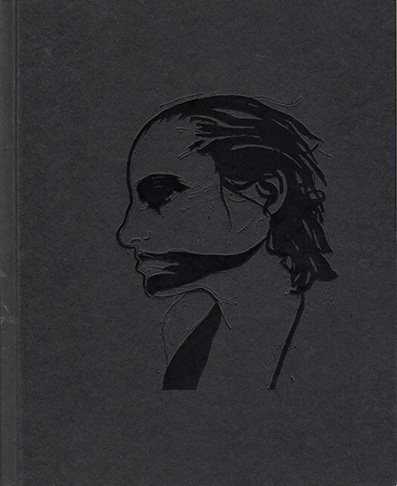 Black thick hardcover with embossed image and title in black and silver. "The framework for this is an architecture of elements normally used for scaffolding or stage construction. The display consists of carrier material that is quite literally used to visualise structures that would otherwise remain in the background. In this respect, there is a symbiosis between the presentation itself and the display of the construct of representation. The sum of the parts not only adds up to an exuberant exhibition in the main room of 21er Haus, but also creates a stage on which Franz Graf constantly expands his installation throughout the duration of the show, by repositioning and rehanging pieces, and with regular performances and collaborative art productions. Visitors thus step onto a stage on which, together with Graf, guest artists and inter-related works, they themselves become actors in a process of ongoing adaptation to an ever-changing situation. But is there more to it than simply being there? Can the exhibition break free from the patterns of representation and offer direct, sensory access to, or perhaps even allow entrance into, the world of Franz Graf? Blessed indeed are they that „have not seen, and yet have believed“. "Für seine Ausstellung im 21er Haus in Wien verzahnt Graf die vielen Ebenen seines Werks, um sein charakteristisches Spiel mit Leere und Fülle, Schwarz-Weiß-Kontrasten, kleinen zarten Details und großem Ikonenhaftem, Archaischem und Modernem zu treiben. Dafür produzierte er eine neue Werkserie, in der Arbeiten von internationalen und nationalen zeitgenössischen Künstlern sowie Werke aus der Sammlung des Belvedere und aus jener des Künstlers einander gegenübergestellt werden. Der Katalog enthält einen einführenden Text von Kurator Severin Dünser sowie ein Interview mit dem Künstler. Harald Krejci widmet sich dem Thema der Autorschaft und Marcus Steinweg nähert sich mittels eines experimentellen philosophischen Texts zu „Form und Exzess“ dem Werk Franz Grafs."